Core Black / Hi-Res Orange / Gold Met. 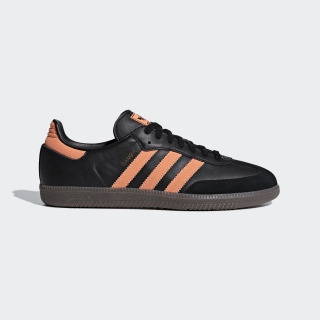 Football-inspired shoes with colours inspired by '80s fashion. Designed in the '50s as an indoor trainer, the Samba has stepped through the decades as a street-style icon. These shoes add a retro vibe to the original look with colours inspired by '80s-era Japan editions. Product colour: Core Black / Hi-Res Orange / Gold Met.